Hailing from North America, the passion flower, also known as maypop and passiflora, is popular for its exotic, almost prehistoric appearance, but also widely used as an herbal medicine today as it was for the early inhabitants of North America. In keeping with its beautiful, otherworldly appearance, passion flower, also known as maypop flower, passiflora flower, and passionflower herb, among other names, has decorated the North American southeast for thousands of years. Passion flower properties have found many uses in both traditional and modern herbal practice. Inducing sleep and relaxation. Passion flower increases the prevalence of a compound called gamma aminobutyric acid in the body. This compound lowers activity levels of parts of the brain, which causes a feeling of relaxation and works as a powerful sedative. Reducing anxiety. Some studies have shown passion flower to be just as effective as prescription drugs when treating anxiety. It has also been shown to reduce the emotional symptoms of drug withdrawal, including anxiety, irritability, and insomnia. Relieving asthma. Passion flower can relieve asthma symptoms due to its antispasmodic properties. Treating bacterial infections. Through its antimicrobial compounds, passion flower can treat minor bacterial infections, such as vaginitis in women. Traditionally, Native Americans have used the maypop flower or purple passion flower for alleviating anxiety and insomnia. In modern times, it is also regarded as an effective treatment for withdrawal symptoms in people addicted to narcotics and alcohol. 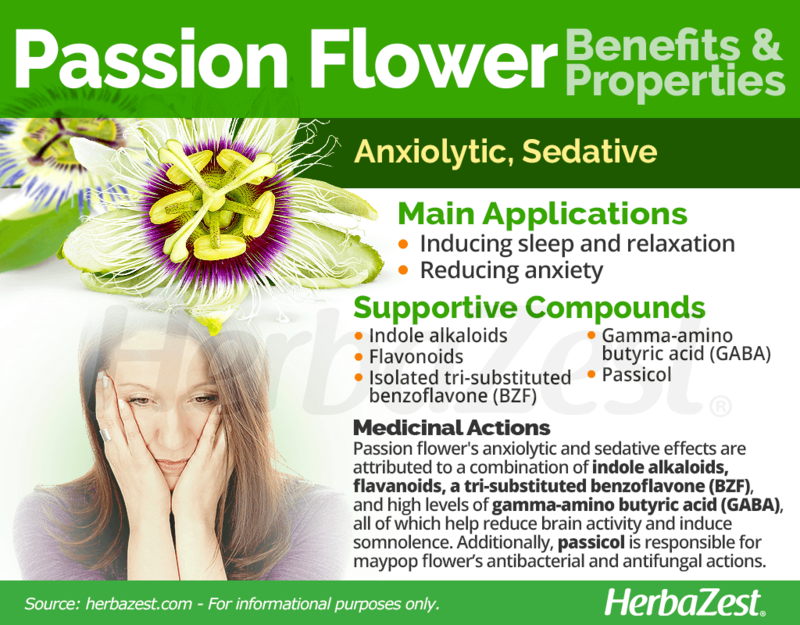 There's some controversy about whether passion flower's sedative effects are due to indole alkaloids such as harmane, harmaline, and harmol; flavonoids such as apigenin, luteolin, and scopoletin; or an isolated tri-substituted benzoflavone (BZF). However, it has been determined that Passiflora contains high levels of gamma-amino butyric acid (GABA), which is an inhibitor of neurotransmitters and reduces brain activity, hence inducing somnolence. Preliminar research suggests that a tri-substituted benzoflavone (BZF) in purple passion flower can help treat drug dependence caused by long-term use of benzodiazepines. Additionally, the phytochemicals contained in passion flowers are also considered antitussive, which helps with cough-related conditions. Among passion flower's chemical constituents, passicol is particularly important for its antibacterial, and antifungal actions. Furthermore, the flavonoids in passion flowers - and, to some extent, the fruit of the passiflora plant - have been shown to prevent the oxidation of testosterone and have a positive effect on estrogen levels in women. NATIVE AMERICAN APPLICATIONS FOR THE PASSIONFLOWER HERB INCLUDE USING IT AS A MILD SEDATIVE. Other herbs with sedative properties are lemon balm, St. John's wort, and valerian. The purple passion flower is likely safe for most people when taken by mouth. However, it is unsafe when taken in excess. Known side effects of passion flower include dizziness, confusion, irregular muscle action and coordination, altered consciousness, and inflamed blood vessels. Passion flower affects the central nervous system. Because of this, it can increase the effects of anesthesia and should not be taken prior to surgery. Women who are pregnant or breastfeed should consult a physician before taking passion flower medicinally, since it contains chemicals that can cause uterine contractions. While it is often used for culinary purposes, the most effective way of obtaining the health benefits from passion flower is in medicinal forms of consumption, where the properties are more concentrated. Raw. 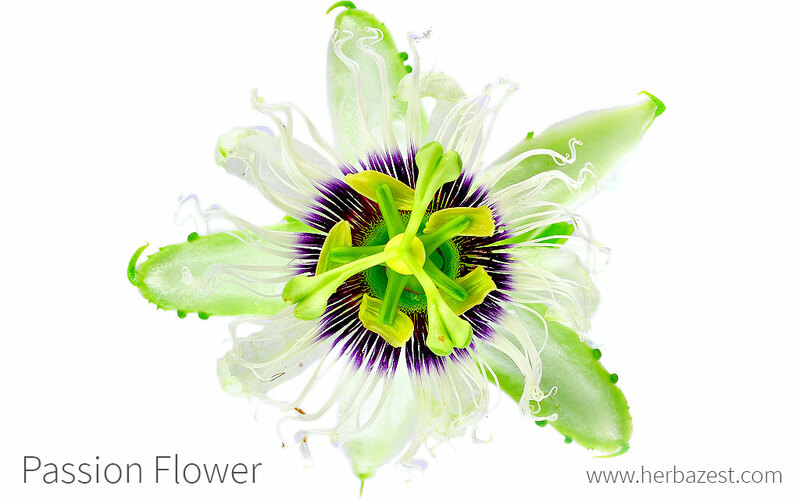 In its raw form, passion flower treats asthma thanks to its antispasmodic properties. Infusion. When brewed into a warm infusion, the maypop flower provides highly potent sedative and anxiolytic properties, which lower brain activity, induce somnolence, and can lessen the symptoms of drug withdrawal. Powder. Dried and finely ground, passion flower can be blended into smoothies or other drinks, in order to lessen anxiety, as well as for treating infections, thanks to its antimicrobial properties. Syrup. In this medicinal form, purple passion flower syrups promote relaxation and can help treat bacterial infections, such as vaginitis. Tincture. In this form, the sedative properties of passion flower induce relaxation and its a natural sleep aid. Capsules. 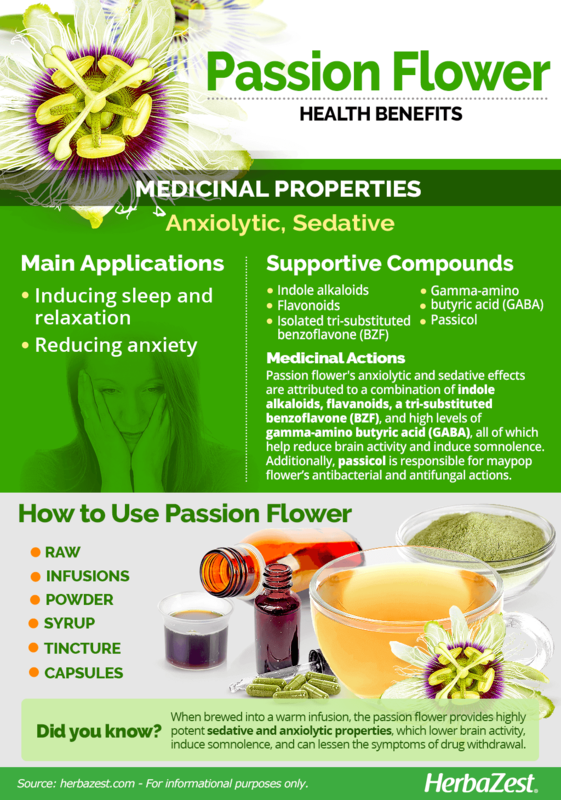 Passion flower capsules are popularly used to treat insomnia and other sleep disorders, as well as for anxiety relief. Full-sized passion flower plants are widely available at garden stores and nurseries during spring and summer months, and they can be found in the wild throughout North America. Its fruit and flowers are sometimes sold separately at organic stores or local farmers' markets, though passion fruit teas are far more common and often carried in supermarkets. 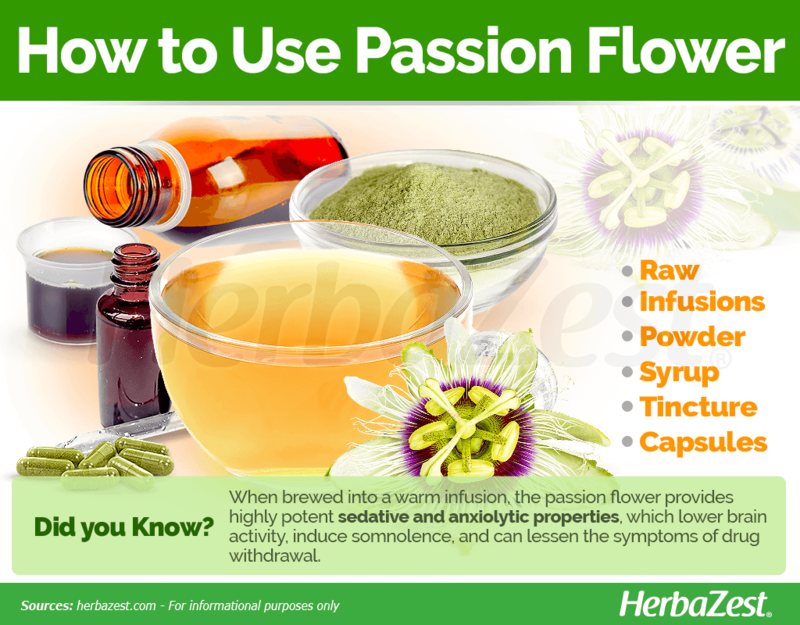 As information becomes widespread about passion flower benefits, more locations are including herbal supplements of it alongside other common herbs. Capsules and liquid extracts are now found at some wholesale retailers, specialized health stores, and online. One of the hardier species in the Passiflora genus, the purple passion plant, also known as maypop vine, is a perennial that can survive temperatures as low as 41 - 45° F (5 - 7° C). Because of its unique beauty and medicinal benefits, the purple passion plant is become a more common feature in many gardens. Passiflora seeds should be soaked in water before planting to aid germination. Otherwise it can take up to 12 months for the plants to sprout. The purple passion plant thrives in full sun, but it can also tolerate partial shade. This is a hardy plant, but growing it in a sheltered spot will give it a best chance of surviving. Pruning is recommended for optimum growth, and the maypop vine itself can be trained up a wall or alternatively left as ground cover. Passiflora plants are prone to aphid damage, so precautions should be taken against these pests. If growing a purple passion plant in a south-facing glasshouse or conservatory, protection from direct sunlight may be needed to prevent its leaves from scorching. Scientifically known as Passiflora incarnata, this perennial species, which can reach up to 30 feet (9 m) long, goes by many different names, including maypop vine, purple passion plant, passionflower herb, wild apricot, and wild passion vine. The stems, which can be smooth or pubescent, are long and trailing, possessing many tendrils. Passiflora leaves, deep green in color, are typically 3-lobed, they can occasionally be 5-lobed, measuring 2.4--5.9 inches (615 cm) in length. The fleshy fruit is an oval yellow-orange berry about the size of a chicken egg. It starts as green, turning orange as it ripens. It features beautiful, unmistakable flowers with five petals, white and purple fringe, five quite prominent stamens, and three styles. The passion flower blooms for approximately one day. A member of the Passifloraceae family, the purple passion plant (Passiflora incarnata) is closely related to 530 other flowering species, including the popular South American passion fruit (Passiflora edulis). Passion flower is a common name for similar species of the same genus, but Passiflora incarnata has no true subspecies. As an ornamental plant, it has been cultivated for the selection of certain qualities, such as a more vivid color or a change in size, but these differences have not been great enough to warrant distinct classifications. The first to recognize the potential benefits of passion flower were the Cherokee Native Americans, a tribe indigenous to the plant's native lands. They called it ocoee, a name that was later adapted to the Ocoee River and Valley in Tennessee, where it grows in abundance. During the 18th century, the passion flower was brought over to Europe from South America. By the 1820s, passion flower hybrids were quite popular in Great Britain. The Spanish explorers who first brought it over to Europe called it Espina de Cristo (Christ's thorns). In North America, Christian settlers utilized its various parts - petals, stamen, stigmas, and purple fringe - to symbolize the crucifixion of Christwhen spreading word of their religion. Its medicinal value soon became highly prized in Europe, where herbal medicine still employs it today. Now locally known as the state flower of Tennessee, it has now found worldwide fame in this regard and many others. Passion flower is the state wildflower of Tennessee. In areas of wild growth, the large-scale cultivation of the maypop vine or purple passion plant is unnecessary, as it grows widely and quickly. The nutraceutical and pharmaceutical industries, however, are starting to pay more attention to the flower on a commercial level, and today an estimated 50 European countries include it as an active ingredient in sedative products. The United States is the leading producer, followed by Germany. Passion flowers have long been associated with the Passion of Christ and the Crucifixion. To the Spanish Catholics, its ten petals and sepals represented ten disciples who were present for the crucifixion. The three stigma represented the three nails of the cross, the five anthers the wounds of Christ. The numerous fringes represented the crown of thorns in the passion story. In Roman mythology, the passion flower was ruled by Venus and used mystically to bring peace in the home and carried to attract friends and popularity. Landscaping. Due to the vibrant color of its flowers and easy propagation, the purple passion plant is a common ornamental throughout the United States and Canada, as well as in Europe. Gardening. Passion flower's nectar is also a food source for hummingbirds and other wildlife, making it a pleasant attraction in gardens the world over. Personal care. Its lemony aroma has also found applications in perfumery and soaps.